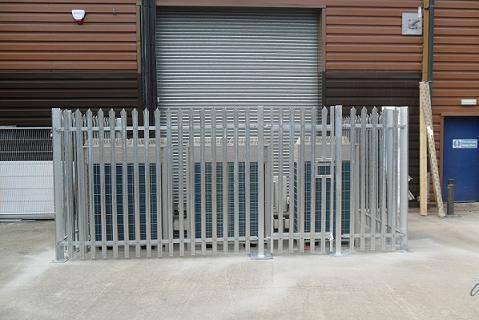 Palisade Fencing provides a very cost effective option for securing property and outdoor installations. The solution detailed shows how an external Air conditioning unit is fenced off at a fairly low height, but still at a level to deter intruders even should they have managed to breach the property’s first boundary security. 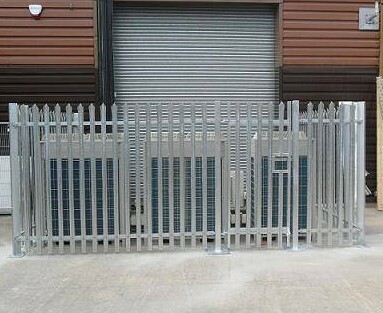 Steel Palisade Fencing example with three pronged top – Also available in a powder coated option. Available in many sizes – welded mesh fencing is a further popular option. The example shown on the right is of an electricity sub station which has been enclosed and made secure with the use of a rigid powder coated mesh panel solution. 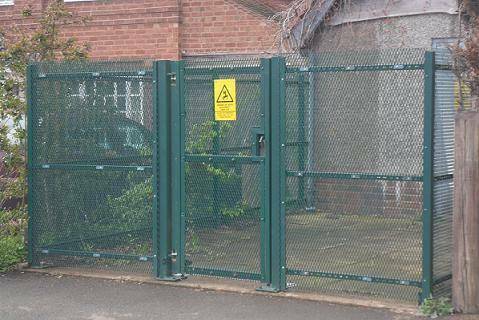 There are many wire mesh and rigid mesh panel solutions available, and whilst some are more suitable for cost effective ‘Ball Court’ environments, used widely on school and sports ground installations in the ‘rolled’ wire mesh variety, there are many stronger and more robust systems available for more high security scenarios. The gauge or size of welded mesh fencing also varies widely, so depending on your particular application, it is always best to seek advice from us first before making your decision. 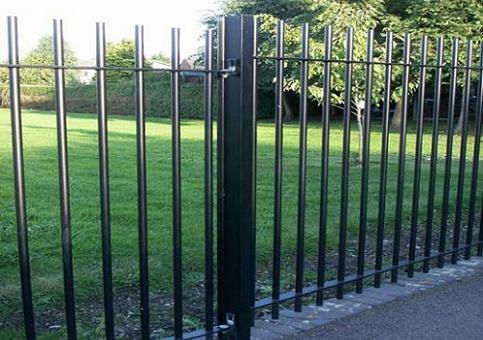 Iron Vertical Bar fencing is used quite commonly in more public areas and and though more pleasing to the eye is not necessarily a softer security option. Many industrial areas and commercial parks use vertical bar railings and gates as a very effective security fencing solution. Used both for residential and commercial applications, Vertical bar fencing or Railings come in many shapes and sizes. They can be cranked on top of a low garden wall without weakening the structure of the brick-work, or as a stand alone solution are available in tubular or boxed metal bars. From simple effective straight up security fencing to highly decorative and bow top railings for the front of residential properties and garden areas, a vertical bar solution is a very solid and more aesthetic way of enclosing softer security level environments. Smaller more ornate sections for residential use can be seen on our Garden Fencing page. Knee Rail fencing comes in both wooden and metal options. 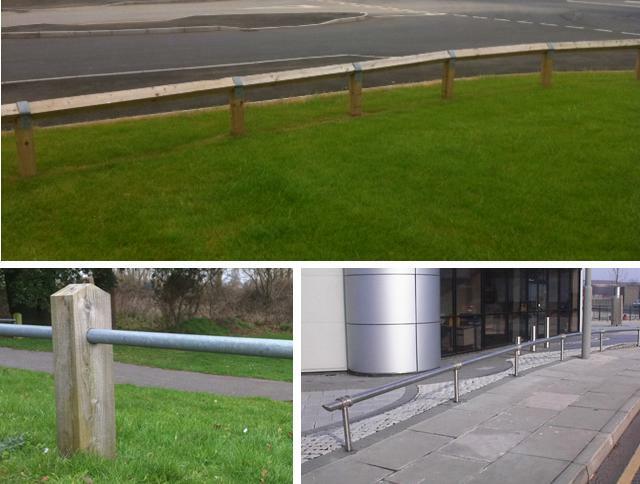 Most commonly found in public areas to help prevent vehicles from mounting large or expansive grassed public areas, knee rails act as a first line of defence against intrusion via the roadways. They are also found put to use in rural areas to demark the boundaries of car parks & picnic areas but can be used in almost any scenario where vehicles are not preferred to gain access. Also occasionally used as a cost effective solution in certain residential installations mainly to the front of large exposed garden areas. Examples shown include (top) a standard ‘diamond’ soft-wood knee rail with birds mouth top Posts approx 100 x 100mm section, nailed with 50mm nails to a typically planed softwood rail with use of a Galvanized strap.Rails for Diamond Knee Rail Fencing usually come in at 75 x 75mm section and are either 1.8 / 2.7 metres in length. Below (left) A Header ‘post & Rail’ solution at knee height (typically around 400 – 600mm in height). Also available powder coated, and (right), an example of a full metal knee rail. We also supply and fit a full range of wooden or metal bollards for public and private property solutions. Commonly intsalled to prevent illegal parking or deny access to areas where safety to the public is paramount, such as in roadways flanking school properties or areas where the public & Pedestrians might frequent but where delivery vehicles may gain limited access at stipulated times of the day. Bollards come in various specifications, heights and materials. Numerous systems are available depending on the specific application or intsallation criteria. Please contact us directly for further advice. 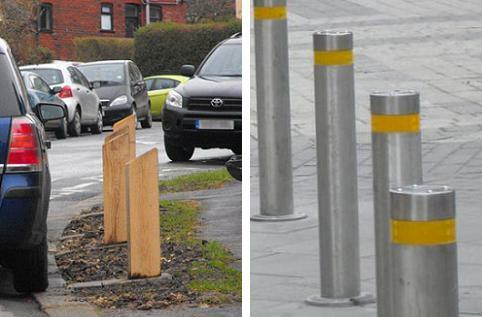 This particular application of wooden bollards stops a car from mounting the edges of a public pedestrian area outside a school area. Despite the obvious deterrent the motorist has still managed to kerb the vehicle just behind a pathway to the road.